generate and view Microsoft HTML Help and wxWidgets HTML Help files. Why not also try our dialog editor for wxWidgets - DialogBlocks. 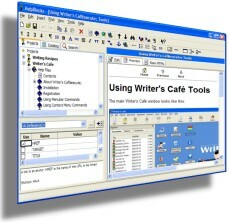 Cross-platform dialog editing made as simple as - well, wxWidgets itself. HelpBlocks provides tools to help make writing your manual as straightforward as possible. Auto-complete and an attribute editor speed up HTML element insertion. Specialised dialogs allow quick selection of page references, images and colours. Project and page templates make light work of creating new projects and pages. If you have an existing MS HTML Help project, you can import it when you create a new HelpBlocks project. And of course, HelpBlocks is cross-platform - edit your files on Windows, Linux or Mac. Download the demo, then if you like it, you can buy it and turn your demo into a fully working version. Subscribe to the Anthemion Developer Tools mailing list for discussion and information about new releases. Edit your HTML pages quickly using the syntax highlighting editor, inserting elements with shortcuts, menu commands and toolbar commands. The built-in preprocessor allows you to create macros to simplify your HTML. Include other files such as page headers with navigation controls, and use conditionals to tailor the help for different platforms or application versions. Browse the catalog for the required HTML element, edit its attributes, and insert it into your page. You can even edit the catalog and choose your own keyboard shortcuts. Type the desired HTML element, then Alt-Enter, to show the element in the catalog. Then type Alt-Enter again to insert the element into the page. Add images, HTML fragments, URL descriptions and text notes to the resource section of your project for later reference. Create and edit your index (HHK file) - if you wish, automatically generate the whole index from the titles in your project.